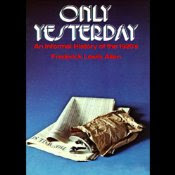 Today's pick is Only Yesterday by Frederick Lewis Allen. This is the very first book I narrated for Blackstone back in 1989. It's the sort of book no one writes anymore: a charming, breezy, informative bit of popular history with no agenda to promote and no axe to grind. Allen wrote for a post-war generation newly awash in technological marvels who found comfort in revisiting a simpler, less hectic time; a time that, after the horrors of the Depression and World War II, must have seemed as distant as Ancient Greece. The recording was made on that wonderful little Akai cassette deck I mentioned earlier, and it's remarkably crisp and clear. You can also hear a healthy dose of the print-through or "echo" I also mentioned. They managed to clean up the quieter parts, but you can't get it out from under the voice itself, and in the breaths and short pauses you can hear little bursts of it. If you listen in the car you won't notice, but over headphones it's a little disconcerting. In 1989 I was living in a tiny, one-bedroom apartment in Washington, D.C., so this must have been done in the single closet off the living room, though I have a memory of sitting at a little desk in my bedroom reading this. Honestly, I recorded just about anywhere in those days, depending on how hot it was or what sort of noises the neighbors were making. I never worried about it, because I could tell if things were amiss and would just throw up another blanket or move closer to the microphone. I even recorded a book in the bathroom of a Holiday Inn in Raleigh, N.C. while visiting my father, who was sick in the hospital at the time. If you were smart about it no one would notice, and I doubt I could listen to those old books now and determine were I was when. Even today my home studio is a little appalling-looking, but I don't care, it's how it sounds that matters. You can spend a fortune on booths and equipment but if you don't know how to use them it doesn't matter. A word about the narration style. After joining the Library of Congress program, I devoted a considerable amount of energy to trying to sound like Alexander Scourby. I failed. It's a little embarrassing to listen to now, and I couldn't replicate it if I tried. There's also a certain blandness to the approach, which is partly attributable to the need for efficiency (punch-ins could be audible and it was important to keep them to a minimum) and partly to confusing Scourby's legendary ease and fluidity with emotional detachment from the text. But I think it's more than listenable, though it would be fun to do it again and warm it up a bit. Please don't mess with your voice. You have a very nice distinctive voice and it'd be a shame to mess it up. I love your performance of Mark Twain and look forward to the second and third installments of the autobiography. I wondered about whether the punchins were audible when you mentioned them before. My experience with tape decks (granted, this was in a dinky radio station about 40 years ago!) was that starting and stopping a tape usually left an audible click on the recording. I spent a lot of time with that red grease pencil and splicing tape trying to clean stuff like that up. ...Oh, and speaking of Mark Twain: I see you're on the calendar for "Innocents Abroad" for Blackstone. Not to burden you with still more work, but how's about adding "Roughing It" to the list...? Tad, you're right, you had to look for really good reel-to-reels and cassette decks that didn't leave a pop when you punched in. "Roughing It" is on the schedule for December, I think.